The time has come for the National Hockey League to announce the finalists for each individual award, with Adam Henrique, Ryan Nugent-Hopkins and Gabriel Landeskog already having been named the final three up for the honours of the Calder Trophy, David Backes, Patrice Bergeron and Pavel Datsyuk up for the Selke Trophy, and Brian Campbell, Jordan Eberle and Matt Moulson up for the Lady Byng Trophy. One of the more anticipated awards to be handed out this summer is the Masterton Trophy, which is awarded annually to the player who best exemplifies the qualities of perseverance, sportsmanship and dedication to the game of ice hockey. The reason for this is simple: there are so many great options to chose from. On a list that includes Jaromir Jagr, Daniel Alfredsson, Martin St. Louis and Miikka Kiprusoff, one would have to think that both Max Pacioretty of the Montreal Canadiens and Joffrey Lupul of the Toronto Maple Leafs are honoured to be up for finalist status. That doesn’t mean you shouldn’t be surprised to see them up there, though, especially given what they went through over the last few seasons. Perhaps the easiest of the two incidents to recall is what happened to Pacioretty on March 9 of 2011, when Boston Bruins defenceman Zdeno Chara sent Pacioretty head-first into a stanchion between the players’ benches. The hit was considered such a criminal act by many that fans even began to call Montreal police to file complaints against Chara. In the end, though, Chara was not charged and did not receive a suspension or a fine from the NHL. The lack of discipline on the six-foot-nine defenceman doesn’t mean the hit wasn’t a violent one, though. 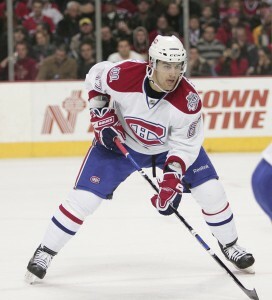 Pacioretty was admitted to a hospital due to a severe concussion and a cracked vertebrae. He was released two days later. Amazingly, Pacioretty was back in time for the first game of the 2011-2012 season, in which he scored 33 goals and had 65 points. Then there is Lupul, who managed to return from a major back injury that had many believing his NHL career was in serious jeopardy. After undergoing surgery in December of 2009, Lupul’s recovery time went from weeks to months due to an infection that came as a result of the surgery, which was performed on a herniated disc in his back. The recovery included another surgery, months of antibiotics and plenty of bed rest according to this article put together by The Associated Press. It took Lupul some time to get his legs back and adjust to the NHL again with 13 points in his first 26 games, but he managed to prove those who thought he career was over wrong once he arrived in Toronto. After registering 18 points in 28 games with the Leafs in 2010-2011, Lupul set a career high in points with 67 in 66 games and managed to reach the 20-goal plateau for the fourth time in his career. Lupul’s on-ice success has helped him gain plenty of recognition in the city of Toronto and all across the NHL. He also plays an important leadership role on the Leafs as one of the team’s top players. So now that a case has been made for both players to take home the Masterton Trophy, the question now becomes who will win the award? At this rate, the race between the two players is certainly too close to call and, in this situation, you can truthfully say that both players are deserving. But we must keep two other players in mind as well. They are, of course, Jordin Tootoo of the Nashville Predators and Manny Malhotra of the Vancouver Canucks. Tootoo, 29, recently successfully defeated demons that drove him towards substance abuse. He voluntarily entered an in-patient care program in December of 2010 and now finds himself a solid NHLer who has positively contributed to the success of the Predators all season long. Malhotra, a 31-year-old veteran of the league, missed plenty of time last season with an eye injury that affected his vision before returning to the Canucks’ lineup for the Stanley Cup Final last June. While he is back and playing full-time for the Canucks again, Malhotra’s story is a rather heart-warming one as well. While all four players are certainly deserving, one would have to believe that it will be either Toronto’s Joffrey Lupul or Montreal’s Max Pacioretty who will capture the Masterton Trophy when it’s handed out on June 20 in Las Vegas. Regardless of who wins it, though, all four players mentioned above have shown that it’s possible to overcome almost any sort of injury or personal problem. And that’s the biggest lesson.